Last night the meteorologist predicted that we might have up to 8 inches of snow through out the night. Most of the snow was to be from 8-10:00pm. It turned out that ALL of the snow was during that time. So, in its usual Southern style, there was only .5 inches of snow on the ground this morning and most of it was really just slush. Schools were cancelled as of last night and now they are delayed/cancelled for tomorrow. This is due to the fact that Charlotte has only two snowplows (I am guessing) and the snow melt will freeze tonight. If the buses can’t run then the schools all close. Depending on what I had planned to do that day, sometimes I am excited about schools closing and other days I am not. I wasn’t supposed to work today anyway so I would have loved for schools to be open. I was rather looking forward to going to Bible study since it was cancelled last week due to ice. We woke up bright and early this morning and were out in the yard by 9:00am. The kids played with Ella across the street and then her dad, Erik, came out and had a snowball fight with Wilson. Erik is a big kid and is great at giving Wilson another boy to play with since the girls aren’t into snowball fights. Because we only need gloves once a year, we don’t have the proper equipment for playing in the snow. No one had waterproof gloves on (only padded cotton ones) which meant that the throwing of snow only lasted a few minutes before everyones hands were wet and frozen. I am vowing to go find some gloves on clearance so that we will have them for next year. Here are wilson and Erik…..
Wilson and I threw a few at each other as well. Of course, I went to take a picture and he threw one right at me with perfect precision. Can you see it coming at me? Hit me square in the chest. Nice one, Son. My shadow for the day. Adorable, but overly persistent…. In the end, Miller got tired of the snow and we went back to doing what we do everyday that we are home together and outside…..play baseball. As you can see, the day started off well, but as it wore on I grew tired and cranky. Miller did not leave my side all day. I love him to death, but it is difficult to have someone at your side constantly throughout the day. By 3:30 I was yelling at him to get his shoes on so that we could take Faith to gymnastics. I think I yelled at everyone. Thankfully, no one said a word during the ride to gymnastics. I think that they knew better than to speak. This was the perfect time for me to sit by myself, enjoy the quiet and to reset. Looks like we will all be home together again tomorrow. I think it will be the perfect day to go to the YMCA to either workout or just sit around by myself. We may even drive by some houses that I found on Zillow that look very interesting. 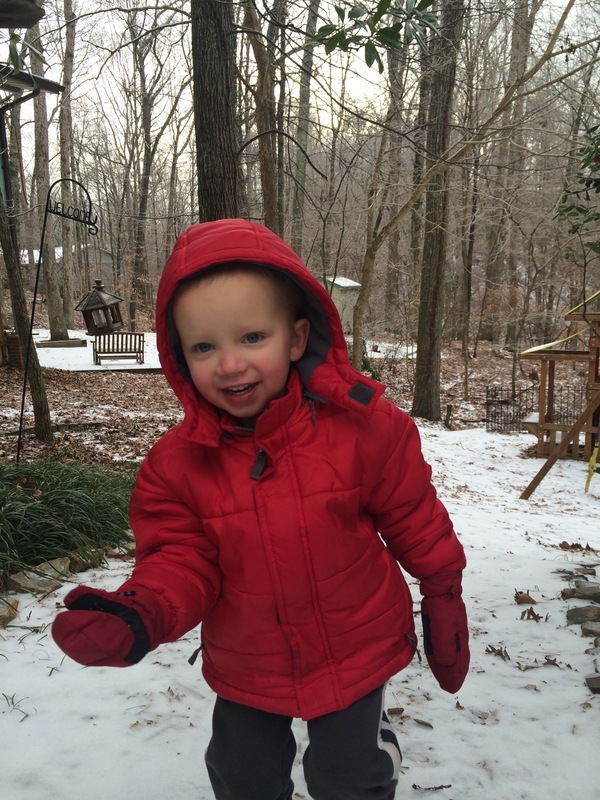 This entry was posted in Uncategorized and tagged day, snow on February 26, 2015 by Becca. One of the biggest stressors in my life right now is where to send kids to school next year. Although I LOVE the school Faith is attending this year, we can’t afford to send two children there and Wilson will be entering kindergarten next year. We have decided to not send Faith to Covenant Day next year (which she doesn’t know yet). We may not even tell her until this summer when we finally know where they will be going. We have sent Faith to the Rolls Royce of schools and I am afraid that it will be hard to find that community and love of a school again. I know that it is time to say “goodbye” to Covenant Day and I am prepared to do so, but it is still a hard thing to do. In Charlotte, there are endless options for schooling: very expensive private schools, expensive Christian schools, less expensive Christian schools, charter, magnet, and public schools. So many choices that it is overwhelming. Here are what we are choosing between for next year…. Option 1: I have entered both Wilson and Faith into the lottery at Union Academy in Monroe, NC. This is a charter school that is about twenty minutes east of us. I have no idea what the chances of getting in are. Wilson has a better chance for kindergarten, but Faith’s chances are even slimmer, assuming that there is even an opening for second grade. I won’t know if they get in until March 9th when they have the lottery. Option 2: Metrolina Christian Academy. It is a Christian school in Indian Trail, NC that is about half the price of Covenant Day. We can get both kids in for what it cost us to send Faith to CDS, however, we are still paying for private school. As I have written before, I have anxiety about paying for school and often compare what we could have done with that money to what I got for schooling. Still, what we paid for Faith to be happy these last two years has been priceless. She has had small class sizes and amazing teachers that love her as a child of God. I was talking to another mom about how my cousin Maddie is very set in her faith and how she talks about it at the public high school that she attends now that she is out of private Christian school. We compared Maddie to my friend’s daughter who has been in the public school since second grade. She said, “I think [my daughter] has been in the public school too long and has learned to pretty much just keep her mouth shut about her faith.” That saddens me. I don’t want my children to get beat down into submission and keep their mouths shut when asked about their faith and belief in God just because no one else believes it or because it goes unspoken. Hence, my dilemma about spending the money and sending them to a Christian school. Our last, but not least option, is to send them to the public school. The only problem with this solution is that we don’t know which school district we will be moving in to. We won’t know that answer until after we sell this house and buy another house (which is a completely different source of stress all together). There are many, many great public schools in our area, so this would not be a bad choice either, I hope. It is just the most vague choice since we don’t know where we are moving….or even IF we are moving. It depends on how quickly our house sells. As Tom has said, “We can’t make a bad choice.” We are blessed to have the chance to make such a decision. Over the past few months I have prayed about this decision and I feel like God has been saying, “Wait.” So I have waited. I have put this decision on the back burner and I have done nothing – I have not even really thought about it. But time has continued to go on and I have gotten impatient with waiting. Last Friday I had a mini panic attack outside of the Trader Joes. I called Metrolina Christian to see what their enrollment was like for next year. They have one space in second grade and a short waiting list for kindergarten. I immediately thought, “Great! Now I have waited too long and this is not an option for us any longer.” I was in a small state of panic. I called Tom and we agree to apply to the school “just in case”. So much for patiently waiting. The one good thing that came out of this panic was that I realized how important it was for me that the kids go to a Christian school. Maybe it is because we had a such a wonderful experience at CDS and I don’t know any different. I may have the same experience at a public school. I don’t know. I need that kind of peace. I am one of the most indecisive people I know. I have a hard time ordering from a large menu – so many things to consider: How much does it cost? Does it match what I want to drink? Is it healthy? Can I cook it at home? Arggghhhh! If I can’t decide on what I should eat then how can I decide which house to buy or where to send my kids to school?? Thankfully, God knows the answer to all of these questions. I just have to listen and take the baby steps that He tells me to take so that I can walk in the right direction. This entry was posted in Uncategorized and tagged decision, metrolina, school on February 21, 2015 by Becca. It is a good thing that I was resting up last weekend because little did I know that I was going to need the extra energy this week. 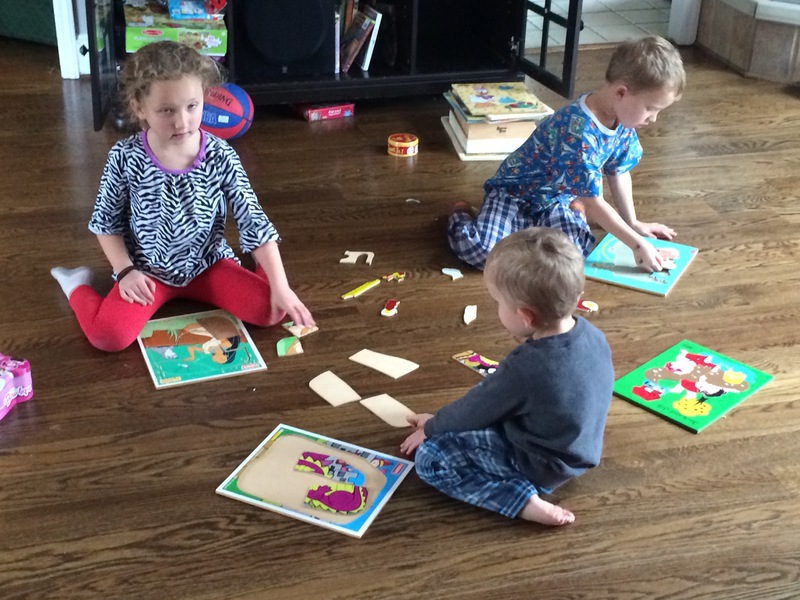 Since 1:30 pm on Monday afternoon I have been at home with all three kids (minus five hours on Wednesday). We were iced in on Tuesday, school was cancelled Wednesday, Bible study was cancelled Thursday so we all just stayed home, and on Friday (today) Faith was throwing up all day so I couldn’t go to work. It has also been terribly frigid outside so no one has left the house since Wednesday evening. The worst part has been Faith’s illness. I heard her moaning around midnight and then she told me that her stomach hurt. I always know that means that a throw up is just around the corner. Yep, about ten minutes later. So by midnight last night I had Wilson in my bed, whom I moved shortly after, then Faith got sick and then Miller climbed into bed with me. I got up with Faith every few hours and then snuggled up to Miller in between. Interestingly, Ella from across the street came down with the exact same illness at the exact same time last night. I assume that they both go it when they were together with me at McDonalds on Tuesday. Three day incubation period, right? Now I understand why my friend Stephanie said that she wouldn’t take her kids to Monkey Joes during flu season. From now on we won’t be going to climb on any playlands during this time of year either. Over the last five days I have played basketball, done homework, made cookies, made bread, played with Legos, played numerous board games, watched movies, painted walls, sword fought, done endless amounts of laundry, and spent hours upon hours of quality time with my kids. I continuously say that I long for the days of when the four of us used to spend every day at home together with nothing to do but play. Well, I got my wish. I have had virtually four straight days of time at home with the kids. I am tired, but I have loved it. Faith said that she wishes that we could spend everyday at home. I told her that I would have to be her teacher, and quickly she said that she does not want me to do that. Me neither. Although it has been fun, I was so relieved when Tom called to say that he was coming home from work early today. He arrived at 3:00pm which meant that I was asleep in my bed by 3:15pm. I slept until 5:00!! I was exhausted. Now I am just praying that I don’t get what Faith has. It looks terrible. I had no idea what this week would entail. It was fun. Getting a “winter mix” was exciting, Wilson staying home from school all week even though he could have gone back Thursday was fun, no preschool work for me was relieving, getting some painting done downstairs eased my stress, and enjoying my family at home was what I have been wanting. It was exhausting, but other than Faith being sick, it was a great week. This entry was posted in Uncategorized on February 20, 2015 by Becca. I was in the line at Costco one afternoon when I realized that everything in my cart was processed. It was organic, but it was still in a wrapper or in the shape of a bar. Not much if it still had to be cooked. I left there feeling like something different needed to happen in my kitchen. Somewhere along the way I had heard of the website “100 days of real food”. This website was created by a fellow Charlotte mom who realized that her family wasn’t eating real food either. She vowed to feed her family only “real food” for 100 days. She has a fabulous website!! It is amazing what she has accomplished and the time she has put into her site. I found a plethora of recipes that I could try. Because she only buys prepared foods that have less than five ingredients, I knew that I would be willing to feed my family the food that she cooks. She lives by the same food standards that I do: organic, all natural, etc. Beware, however, the woman is not afraid to use some butter. Through her website I found another gem: Plan to Eat. (www.plantoeat.com) The most awesome recipe and menu planning website ever! It allows you to import all of your own recipes/recipes on the web with the click of a button, plan a weekly/monthly menu, and then it organizes your shopping list! Brilliant!! It has transformed the way I plan meals. I used to think about what I was going to cook for dinner around 3:00 pm that afternoon, dig through the fridge and then either make something boring with what I had or just decide to have cereal for dinner because I knew the kids would actually eat it. Now, I plan 3-4 days of meals, make sure I have the ingredients, and know ahead of time what I will make. Because it is so easy to import recipes, I can add ones that I find on the internet or the 100 Days of Real Food site. Then I can scan through them and choose some interesting ones for the week. So far I have made my own baked beans in the crock pot, stuffing, veggie burgers, cauliflower rice, and mini pizza pockets. Some were delicious (like the baked beans) and others (like cauliflower rice) were so-so at best. Faith still refuses to eat most of it, but my motto is “eat it or go hungry”. She has that choice. I will continue to try to cook more often and to make a wider variety of foods. Now, all that being said, I know that real food is best, but the store bought granola bars and snacks aren’t going away, they will just be eaten less. Life is crazy enough without me spending all of my time in my kitchen cooking and doing more dishes. There is still a quality if life number that I have to consider. I equate cooking everything I eat to homeschooling – I wasn’t cut out to be a homeschool mom and I am not cut out to bake all my bread, make my own granola bars and make dinner every night. I am not that disciplined nor am I that creative. Somethings you have to leave to the professionals. If I can buy organic snacks for the kids and it saves me my sanity, then I will buy some snacks. But we don’t eat them quickly. I have had the same giant bag of Veggie Straws (which actually aren’t vegetables at all) in my pantry for almost two months. Snacks make lunches easier. Sadly, I don’t have kids that will eat heart shaped sandwiches or stuffed avocados for lunch like the super-moms on the internet have. Mine want gummies, fruit and some sort of drinkable yogurt (all organic, of course!). I am excited about my new strategy and motivation for cooking more original meals for the family. I hope that this will make cooking dinner seem less daunting of a task. So far I have enjoyed cooking more and meal planning is much less overwhelming. I will actually use the recipes that I like. I have ten cookbooks in my pantry that I have never even opened, much less pull out on a regular basis to cook an exquisite meal. If you have the same problem cooking that I do, please, check out the Plan to Eat website. There is a 30 day trial membership and after that it is a measly $6 per month. Totally worth it!! This entry was posted in Uncategorized and tagged food, real on February 18, 2015 by Becca. Here in the south we only get one, maybe two, snow days each year. Half of those snow days are not for actual snow but for what is called a “wintery mix”. Last night we received a half inch of wintery mix precipitation – mainly ice. When we woke this morning things were a little whiter but were as hard as a rock. It didn’t matter to the kids what had fallen from the sky, just as long as they could bundle up and play in it. Of course this dusting of ice and snow caused all schools to be closed today and they will be closed tomorrow because it will all refreeze tonight. Here is what the front yard looked like…. There was enough for Miller to throw ice dust at me and for Faith and Ella to sled from one house to another on the ice…. I have a video of the sledding on Facebook that I need to bring over to the blog. The sledding actually worked really well. I just had to make sure that the sled didn’t take a turn and head down the road where it would have picked up speed quickly. I told the girls that if the sled wouldn’t stop to “roll off” of it onto the hard, icy ground. Thank goodness we have a lot of bushes in front of the house because that is how they stopped the sleds. Ice doesn’t easily allow for slowing down or stopping. The girls played outside all most all day. It was fabulous. We only get snow once a year so this is all very exciting!
. 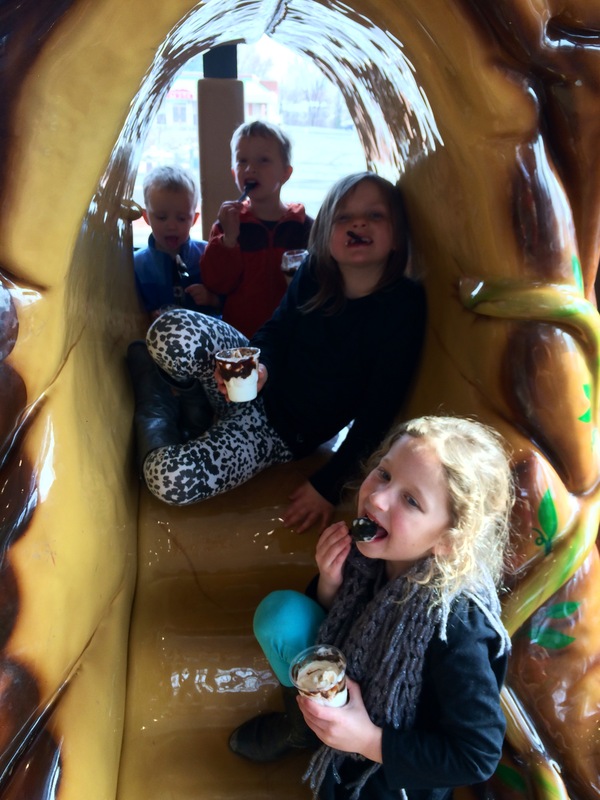 We spent a fair amount of time at McDonalds eating ice cream and creating an obstacle course for them to run while to time them on it. It was a nice break. I have already received news that we are off again tomorrow. :). Faith has off this whole week from school anyway so it is kind of fun that we are all at home with her. It has made for a nice “stay-cation”. Who knows what we will come up with to do tomorrow. 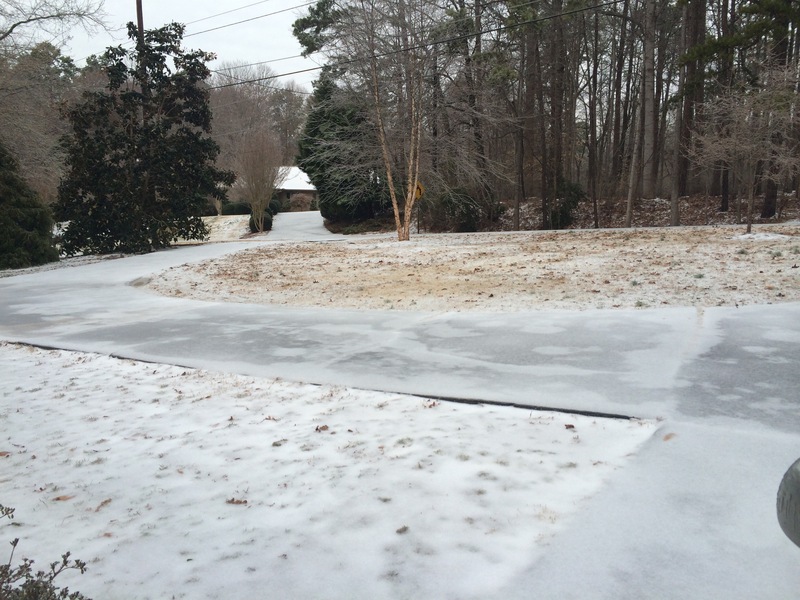 This entry was posted in Uncategorized and tagged charlotte, snow on February 17, 2015 by Becca. Last month I told Tom that I needed a weekend away from cooking, cleaning, remodeling and being a mother. His response was, “Good. Go.” (He is a man of very few words sometimes.). I then thought to myself – where in the world am I going to go? 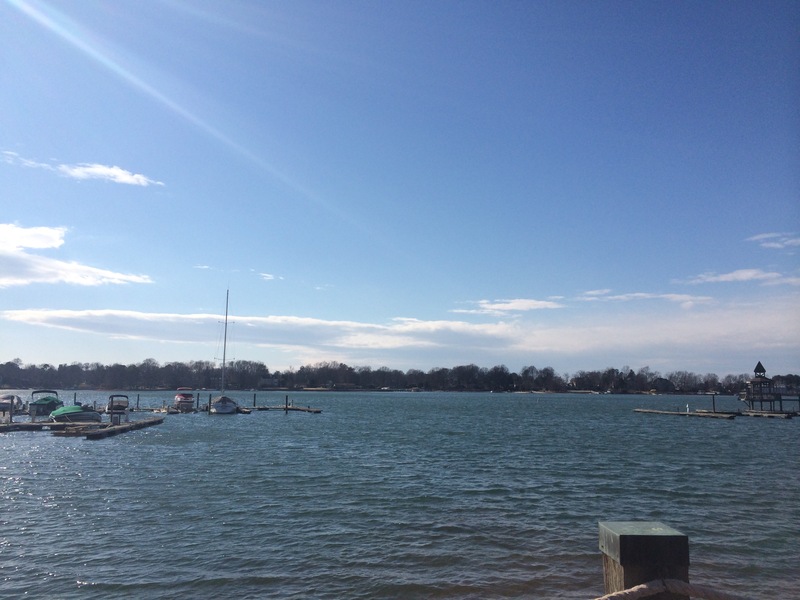 Thankfully, my sweet Uncle Doug has a condo on Lake Norman, about forty minutes away, that he said I could use. I had originally planned to go next weekend, but Tom decided to run in a ten mile race next Saturday so I moved up my getaway weekend to this weekend – Valentines weekend. A few friends thought that it was very strange that I would go away on Valentines weekend, but anyone that knows me knows I am not much of a romantic. I actually do not like Valentine’s Day. To me, it is a holiday that forces everyone be romantic one day of the year. I would much rather be romantic on a random Tuesday then on a day when everyone is being romantic because they feel that they have to be. So, being the rebel that I am, I went away for the weekend to rest and to be alone. Of course when Faith found out that I was going away on Valentines weekend she cried and said that we needed to be together. That feeling must have passed because they didn’t come up and see me as planned. I love my children and husband, but I really just wanted the whole weekend to myself. I have books to read, a Bible study to do, and just general laying around on my list. Last night I met my long time friend, Patty, out for dinner. She lives only a few exits away from the condo where I am in Davidson, NC. Davidson is a cute town that I have never been to before now. We met at Brick House for dinner and drinks. Of course, dinner with Patty is always a 2-3 hour affair because she and I have so much to catch up on. I loved the dinner and I have been eating the leftovers all day which fits in perfectly with my “no cooking” rule. Tom texted me late Friday night to say that all was well and that the kids were all sleeping with him in our bed because they missed me. Very sweet. I am sure that they are having a blast eating pizza, watching movies and drinking milk all weekend. I woke up this morning at 9:00am (which is very late). I never get to sleep in that long. I woke up, leisurely at breakfast, drank my chai tea and read my new book. My friend, Erin, texted me around 10:00 to ask if I was bored yet. LOL! I did get bored by about noon so I set off to find a coffee shop so that I could do my Bible study and get out of the condo. By the time I left the coffee shop my bottom hurt from sitting down so much. I rarely ever sit down so I am sure my body was beginning think -WHAT IS GOING ON AROUND HERE?!?! A nice walk around the lake cured that ailment and now I am back to sitting, reading and relaxing for the rest of the evening. Anyone jealous yet? My husband is a very kind man for letting me escape reality for 48 hours. Every six months or so I need a few days to remember who I am and what is important to me. During this time I have thanked God many times for my family and all of the blessings that we have in this life. The lake is beautiful to admire and I will look forward to returning home to Tom, the kids and the chaos that is my life tomorrow afternoon. For now , I will bask in the quiet and stillness of my little vacation nest. This entry was posted in Uncategorized and tagged away, davidson, valentines, weekend on February 13, 2015 by Becca. Oddly enough, all of the kids stayed home with me on Tuesday. Faith had a slight fever, Miller is always at home on Tuesdays and Wilson wanted to stay at home because he didn’t want to feel left out. It was great to be at home together all day. Of course the day started out with some TV, but after that the kids did puzzles, made valentines, and then did more puzzles. Wilson and miller were cute helping each other put on all of the tattoos that were supposed to go to Wilson’s friends at school. Wilson didn’t want to write his name 20 times so he sent in zero valentines and used a good bit of the tatoos…..who can blame him! Here are the boys putting on the tatoos. I assume Miller is wearing his bike helmet because I let him ride his bike in the house and he knows that safety comes first! Wilson is usually a really great big brother. He loves being the leader and a helper. That afternoon we all made pizza pockets. I have been reading the “100 Days of Real Food” blog and have been inspired to change what we eat. I am already obsessed with organic food, but am now making it more homemade. 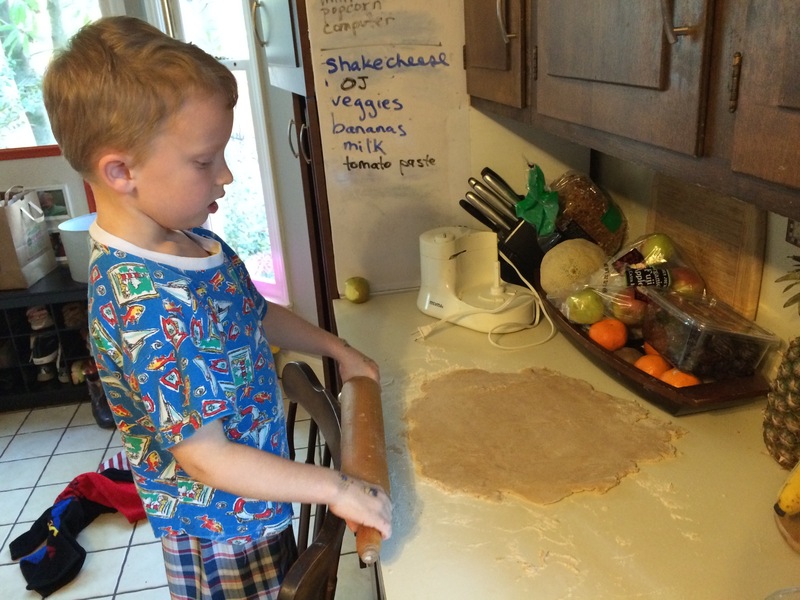 Wilson helped me roll out the dough and then all of the kids helped me stuff the pockets with pesto, red sauce and a variety of cheeses. I felt like such a “homeschool” mom. As usual, it was wonderful to be at home with the three kids and have nothing in particular to do. In addition to cooking and playing, I also painted the guest bathroom. We are still hoping to sell the house soon so I have to use all of the extra time that I have to get a room or two ready. Of course I let the kids watch a few TV shows during some of the painting time, but it really only took an hour or two to paint and trim it out. Multitask!! I loved my day with the kids. They got along so well together and it was fun to give them the individual time that they deserved. This entry was posted in Uncategorized and tagged Tuesday on February 12, 2015 by Becca.